These days, collaborations between fashion brands and artists are common. This wasn’t always the case, though – when Louis Vuitton unveiled a street-smart graffiti collab with New York designer and artist Stephen Sprouse in 2001, it set the precedent for the new millennium. Although the house has always had a relationship to the arts (fun fact: its founder was the first to see Monet’s seminal “Impression: Sunrise” back in 1874) since 2001 that has only gotten stronger – with the news that Jeff Koons is pairing with LV being announced just this week. Giving the world at large a chance to buy into the work of some of the most seminal artists of our times, the collections have both revived cult figures (as with Sprouse) and created some of the most copied bags of all times (thanks to Murakami’s multicolore monogram). As Koons joins the club, we look back at some of the best Louis Vuitton artist projects over the years. The late Stephen Sprouse, a designer and artist who went bankrupt in 1985 despite being an industry favourite, was the first to be tapped for Louis Vuitton by then-artistic director Marc Jacobs. It was a groundbreaking move for the house, which had previously treated the famous LV monogram and as sacrosanct, not allowing it to be altered in any way. The neon graffiti monogram bags were a vibrant injection of an inherently New York and very rebellious attitude that marked an exciting direction for both the brand and fashion at large. Unsurprisingly the collection (and the later collaboration in 2008 of graffiti leopard print accessories released after Sprouse’s death in 2004) sold out immediately. When Jacobs left the house in 2013, model Edie Campbell walked the runway covered in black sparkling Sprouse body paint, in homage to one of the designer’s most memorable moments for the house. For SS03, Vuitton enlisted contemporary Japanese artist Takashi Murakami on a collection which launched some of the most iconic It Bags of the early 00s. His white Multicolore Monogram accessories were forever immortalised in everyone’s minds thanks to appearing on the arms of celebrities like Paris Hilton and Lindsay Lohan in the cult movie Mean Girls – and the black iterations were just as popular. Murakami's further collections – Cerises, Cherry Blossom, Monogramoflague – and his character print bags were just as coveted, and although it was previously announced that the relationship between Murakami and Louis Vuitton was coming to an end after 13 years, a few accessories created by the artist remain in stores globally today. Marc Jacobs was inspired to work with art world anti-hero Richard Prince after his controversial Spiritual America exhibition in 2007. The collaboration was unveiled at the SS08 runway show, which opened with 12 models (including Naomi Campbell) dressed as nurses, each with a letter emblazoned on their hats to spell out ‘Louis Vuitton’. It was a nod to Prince’s famous Nurse paintings (as seen on Sonic Youth’s Sonic Nurse cover). As for the bags, they featured his Jokes series – their messages printed over a reimagined, washed out monogram, with snakeskin accents for good measure. More recently, one of Prince’s Joke works was used in Raf Simons’ debut campaign for Calvin Klein, appearing in the art gallery backdrop of the images. Bold yet playful, the 2012 collaboration with 83-year-old artist Yayoi Kusama is one of the most visually captivating collections of Louis Vuitton. The Japanese legend’s dotty artwork populated handbags, clothes and accessories echoing her message of obsession and seriality. To coincide with the launch of the collection, stores across the globe were transformed. 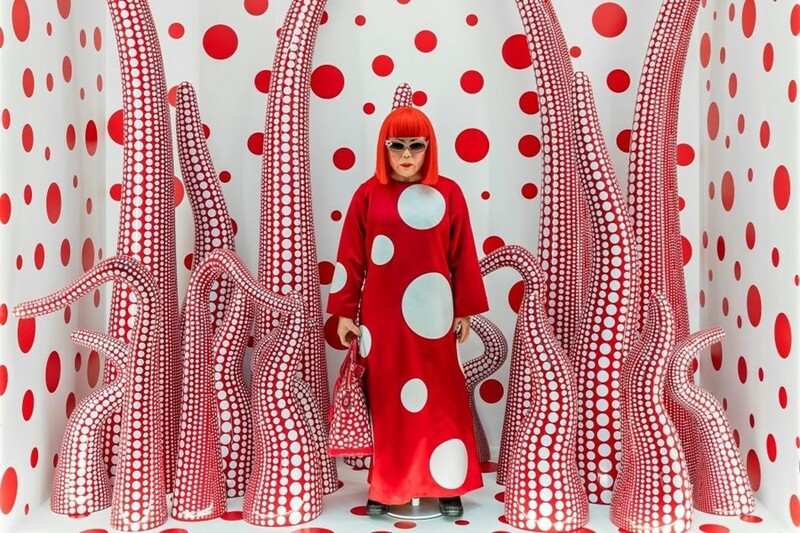 In Selfridges, the concept store saw the indoor space become into a polka dot fantasy world, with one window complete with an eerily realistic red-wig-wearing wax replica of Kusama. Launched to coincide with the 160th anniversary of the house in 2014, the ‘Iconoclasts’ collection saw six art and design legends – including Karl Lagerfeld, Rei Kawakubo and Frank Gehry (the architect behind Fondation Louis Vuitton) to name a few. The brilliant Cindy Sherman created a trunk for the collection with multicoloured drawers inspired by her parrot Mister Frieda. The icons appeared with their creations in Harper’s Bazaar – with the exception of the ever mysterious Rei Kawakubo, who was only seen in illustration form alongside her creation ‘Bag with Holes’. For the promotional imagery, model Julia Nobis was made up like a clown suitable of Sherman’s own photography. Dark duo the Chapman brothers (Jake & Dinos) were tapped not once, but twice by artistic director of men's collections – Kim Jones. 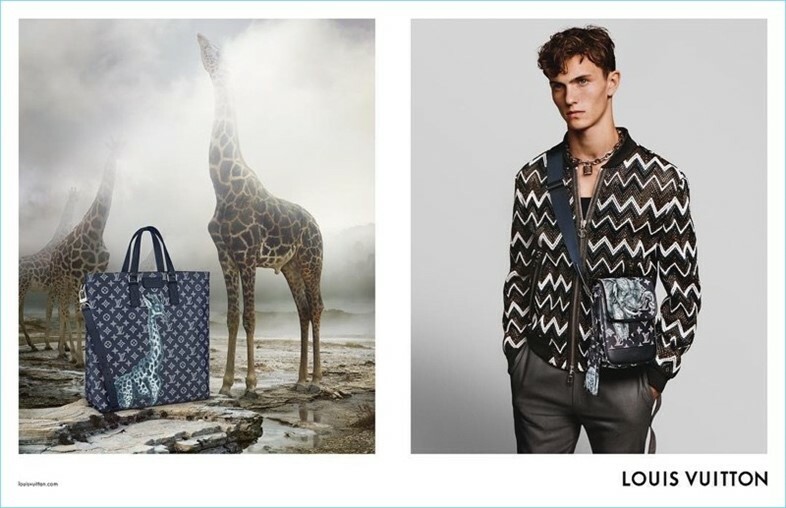 Firstly, illustrating luggage for the AW13 show (dubbed the Garden of Hell) depicting twisted mountain monsters, but a first for Vuitton’s menswear. More recently the brothers returned to subvert safari animals for the SS17 show. Both collaborations were instantly successful, Instagrammed by just about every attending member of the show.